Etsy is an online marketplace that works as an intermediary between customers and artists, crafters of handmade items or collectors of vintage products. Founded in June 2005, the company’s website Etsy.com was started in Brooklyn, New York, at a high-point for internet startups and new design trends that focus on artisanal and vintage objects. The company engages in customer to customer (C2C) or peer to peer (P2P) e-commerce in which both the seller and the buyer are private individuals or micro-businesses. This is in contrast to other forms of internet commerce such as B2C (business to customer) or B2B (business to business). Products sold and bought through Etsy range from art, clothing, jewelry and other decorative objects to arts and crafts supplies. After the launch of Etsy, the company registered almost immediate success, reaching up to a million in sales within a couple of years. The annual merchandise sales volume has been on a steady increase, rising from 170 thousand U.S. dollars in 2005 to 3.9 billion U.S. dollars in 2018. The company generated revenue of around 604 million U.S. dollars in 2018. Most of the company’s revenue is generated from its marketplace segment. Marketplace revenue is primarily comprised of the 5 percent transaction fee that an Etsy seller pays for each completed transaction, inclusive of shipping fees charged, the listing fee of $0.20 they pays for each item they lists on Etsy.com, and Etsy Payments, the company's payment processing service. In 2018, the number of active sellers through Etsy stood at 2.1 million and the site had 39.4 million active buyers who had bought goods through the platform. 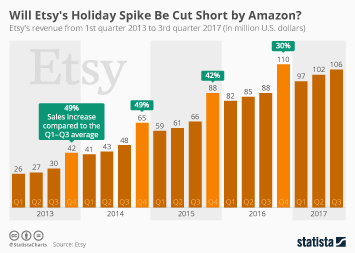 Etsy has been able to build a loyal customer base as is reflected in its distribution of active buyers, where approximately 60 percent of its annual gross merchandise sales in 2018 were repeat purchases. Etsy has also been able to implement and manage a strong mobile strategy. Since 2014, more than half of all web visits to Etsy were through mobile platforms and 55 percent of the company’s gross merchandise sales volume was generated from the use of mobile devices. As of December 2017, Etsy was among the top ten most popular retail websites in the United States. In addition to being an online shop, Etsy also incorporates functions of social networks as users can create personal public profiles, connect with one another, and with features to add friends, write reviews and send messages. The website also bears some similarity to Pinterest, due to its strong visual design and users’ ability to curate collections. More interesting topics from the industry "C2C E-Commerce"